In 1975 a silly sequel was produced under the title The Black Bird. 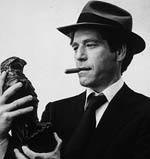 George Segal plays Sam Spade's son who inherits the San Francisco detective agency as well as the Maltese falcon—which you may recall from the previous movie was discovered to be a knock-off. However, Spade the Younger eventually learns it may not be fake after all. A fat man (the fat man?) is found dead in the building, leading to all kinds of complicated and somewhat screwball plot twists, as once again everyone is chasing an elusive prize. George Segal as Spade's son. Lee Patrick who was Spade's tart-tongued secretary Effie in 1941 reprises her role to good effect thirty-four years later. Elisha Cook Jr. is also back as the gunsel, uh, slightly older to say the least. The film was derided by fans of Hammett, Bogart and Huston as a sacrilege, but it's clever enough for quite a few chuckles. Come on, folks, lighten up—it's a parody. A parody that less jaded viewers may manage to find hilarious. If they can find it at all. At this time of writing, The Black Bird appears to be unavailable on DVD. You might find it on tape or showing up on cable TV. Somthing tells me not to expect any more Maltese Falcon sequels after this.